SUMMARY: Designing a meaningful experience for customers online requires a strategic and thoughtful approach that leverages customer education over fear. The right digital experience can create a lasting relationship between a brand and its customers. 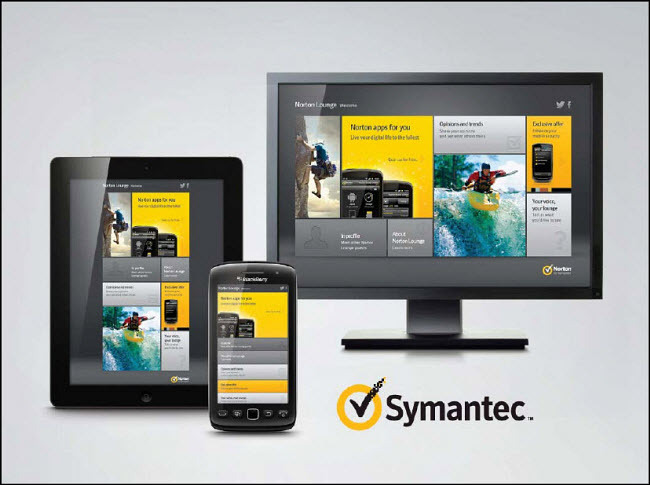 Learn how Symantec pushed customer-focus over product-focus in launching a one-stop digital platform for Norton Security’s content, offers and deals for auto-renewal customers. "Norton has definitely been a household name among consumers for quite some time in the cyber security space," Solange Deschatres, Global Senior Manager of Content Strategy, Symantec, said. Deschatres works on Symantec’s Norton cyber security consumer business and describes Norton’s customers as "becoming increasingly aware of threats and the threat landscape, especially as more and more high profile data breaches, hacks and threats swarm the media." Customers know that these threats exist, she added, but aren’t always aware of what they can do to stay protected when it comes to cyber security software. "Their realm of understanding is often limited to viruses or malware … They also don't know the difference between what different cyber security programs offer. There's a lot out there right now," she said. With a lot of cyber security freeware and operating systems on the market, it is Deschatres and her team’s responsibility to educate customers on cyber security and where other products may leave them vulnerable to attack. "Our main goal with our customers is to provide them with more education around cyber security so that they understand how cyber criminals work and how to be smart about staying safe online as well as communicate the value of Norton, which is really a best in class, multi-layered intelligent cyber security software," she said. Sherri Chien, Director of Content Strategy and Storytelling, Symantec, works for the enterprise security side of Symantec, and said that historically, most security companies’ creative and marketing relies on threats and fear. "We promote breaches and attacks and the need to protect oneself from cyber criminals. I think as a marketing challenge, this tends to disassociate the customer from the brand," she said. In Norton’s case specifically, Chien said, the brand didn’t have a relationship with its auto-renewal customers. "They would receive an auto-renewal notice almost a year after their original purchase. And then, along with standard email and promotional communications along the way, that was what they knew of us," she said. With the Norton Lounge, which was built as a digital experience pilot to reach out to the auto-renewal audience, "what we wanted to do was build an ecosystem of value and benefit, exclusive for the auto-renewal customer base," she said. This was a strategic Web-based initiative to humanize the relationship between Norton and auto-renewal customers, she added, and offer them more than just discounts on products. "We wanted to offer content that the customer would value," Chien said. The team discovered a one percent increase in retention would be equivalent to about a $15 million net revenue gain for the company, so ensuring that customers were having a meaningful experience was also integral to business performance. The Norton Lounge was launched in July 2012 and ran for approximately a year to June 2013. "Metaphorically, we wanted to recruit the experience of a frequent flyer lounge. Basically when you think of a frequent flyer lounge, we're making sure [customers] are viewed truly as an exception to the rule, that they're very special. We wanted to emphasize recognition of them as a customer as opposed to providing them with offers and discounts," Chien said. The Lounge was built out with elements that the team thought would be valuable to the customer. They also wanted to move away from messaging around basic fears and go towards messaging that allowed customers to associate Norton with living their digital life with confidence. "Ultimately this would translate to a business goal of reducing auto-renewal opt-out rates and, in our business, a one percent increase in retention rate is equal to $15 million in net annual revenue. So it was very important for us to try to build that relationship with the customer, and we designed a unique experience for them," Chien said. The Lounge experience, she added, was designed to provide that value to customers and create the "stickiness" of a real relationship for customers with Symantec and Norton. Building out the design of the first version of Norton Lounge was "very unique at the time and interesting," Chien said. The design had tile sections, which featured different types of content. For example, one section was called "Living Well Online" and included curated articles by Marian Merritt, Norton's Internet safety advocate, while providing advice and tips focused on families and kids. "We also had a section that highlighted profiles of customers with diverse interests, which we hoped other people would be able to relate to," she said. There were also various smaller sections, such as surveys and polls, and offers that were exclusive to the auto-renewal customer base. "For the most part, we did not make any major changes to the site over time. We tracked visitor traffic and which sections garnered the most clicks each month," Chien said. The changes that have been made since launching are incremental. For instance, adjusting imagery for seasonality. "We provided offers, again, that were exclusive to the customer base — the auto-renewal customer base — and that was dependent on which product teams we could work with to create that exclusive offer," she said. "So the goals of those changes were to keep the content fresh and relevant." Integrated throughout each element was the overarching business goal of reducing churn and connecting with customers, but there was also the goal of transforming from a product-centric organization to a customer-centric organization. The auto-renewal customers were now being routed through a digital experience designed to reframe the benefits of Internet security with exclusive offers and content. Keeping the idea of customer-centricity as a foundation, the team moved forward with understanding the customer personas coming through the Norton Lounge. There were six personas already in existence at Symantec. These personas were based on an articulation of behaviors, attitudes and preferences amongst the Norton customer population and were constructed from qualitative primary research. Using that as primary research, the team asked themselves what Norton stood for as a business and a brand and, from there, how that could be translated to customers. The team completed a simple exercise where they explained what they wanted people to feel when they’ve engaged with the brand in a message or offer. Terms that came up eventually made up the pillars of what the team referred to as the "Brand Compass." 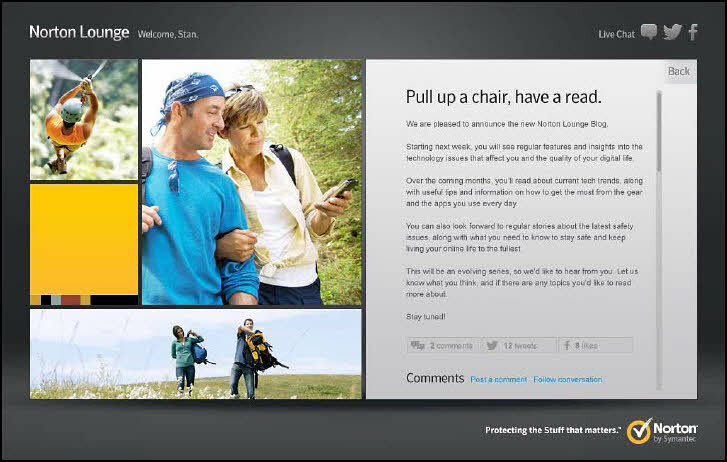 All of the content, images and videos that were incorporated into the Norton Lounge experience were chosen by asking if they were going to deliver on one or more of those attributes. This process was very interesting, Chien said, because "there was obviously a lot of strategy work ahead of the actual implementation of the site." The compass became a shared tool that represented the customer voice and allowed the marketers to step back and realize that it wasn’t always about their own opinion. It acted as a check to ensure that the strategy was being delivered on and that the customer voice was present in every step. By assuring that every video, blog or image posted fulfilled one or more of these attributes, the team hoped customers would be engaged with the brand and the interaction would evoke the feeling of at least one of the three attributes. That is why the team focused on the metaphorical frequent flyer lounge as a guide — it’s an experience that makes the customer feel exceptional and cared for. The team felt that could be extremely valuable, especially with a product that can feel cold or technical. In that vein, the imagery chosen was a marked departure from previous fear-based marketing and included people engaging in extreme sports or otherwise happily living their lives secure in their digital world. The team also made sure that the website was responsive and could give the same personal experience across tablet, smartphone or desktop. 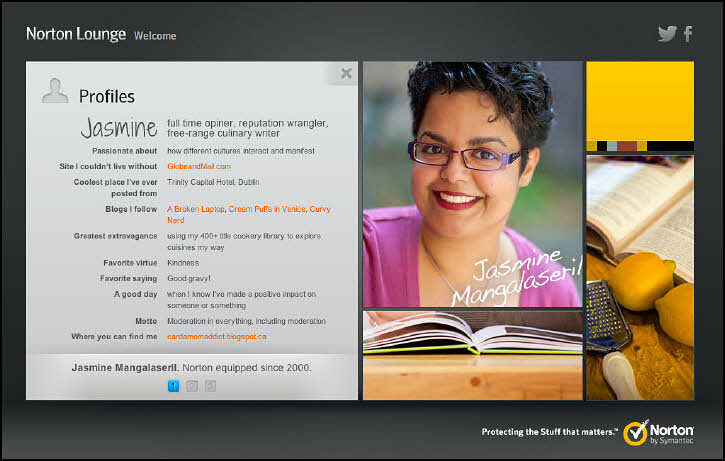 Customers could educate themselves using content that would make them feel fully equipped to choose Norton. Because the Norton Lounge was a pilot program, it gave the team some room to try new things that were, in some cases, counter to how Symantec had historically approached things. A good example is the brand’s shift away from fear-based marketing in its creative — where ads featured a grenade or knife refashioned to look like a computer, with the tagline, "In the hands of a cyber-criminal, a computer is a weapon." The team viewed this shift as an elevation in the customer conversation. Instead of instilling fear, uncertainty and doubt, the brand could be a source of self-actualization, knowledge and equipping customers with Internet security. It was still "definitely a challenge to get something new out there," Chien said, and it required the team championing this change to other teams. The team even designed a lot of the platform on their own, "without actually having the assigned Symantec Web team working on it because it would have taken much too long to get through the approval process and the whole development cycle to get the pilot out and test it," she said. The team also talked to other product teams to find offers they could make exclusive for the auto-renewal customer outside of what would normally be included by Symantec in a campaign or promotion for a product launch. However, if an offer was dependent on other teams, Chien said they did not have the time or resources to help create a special offer for it. They had to have a strict set of criteria to apply to everything for the Lounge. Chien said the criteria for the Lounge that included questions of value. "Does it offer something of perceived value to the auto-renewal customer and is it relevant? Is it relevant to the experience and the auto-renewal customer? We made a lot of decisions based on answers to those questions," she said. "The whole thing was an experiment," Chien said. During the time the Lounge was up, there wasn’t anything drastic that had to be changed, she said. However there were elements like a blog that was added towards the end that did well. "It was just based on how our auto-renewal customers were receiving this information — how were they interacting with the site, what sections did they seem to really like? We responded based on that information," she said. The blog replaced a section that wasn’t getting very much traffic called "Your Voice, Your Lounge," and the blog then quickly grew to be the second highest viewed section after it was launched. "It showed that people actually were interested in the content … people were actually responding well to it," she said. "It helped transform the mindset of marketing from product-centric to customer-centric, for sure, just even picking out those images that not only had digital adventurers but that had people in them … Ever since this pilot, the marketing efforts since then have started becoming more customer-centric with imagery of people, children and less of that dark fear, uncertainty and doubt," Chien said. Moving forward, Symantec wants to continue to take that customer-centric approach to marketing and developing experiences online. "That's extremely valuable because we're addressing their concerns and we're becoming this increasingly trusted source for information and helping them to not only learn about these things and learn about what's happening in the cyber security landscape, but we're also helping them," Deschatres said. The team is looking forward to following this engagement trend upward, Deschatres said, "if we continue to focus and really bring value through content — thoughtful content experiences online." As a result, the team will be developing better content platforms that are more user-experience focused. "The content is going to be easier to access, easily discoverable. We'll take into account what our customers want to know so that we can really deliver that information effectively and also in a way that is engaging and shareable," Deschatres said. What the team has learned from building that relationship with customers and focusing on valuable content has been the key takeaway, Chien said. "It is pretty much something that we are doing today all across the company with everything that we do, making sure that we're creating content that our customers are interested in learning, educating them. It's in our blogs. It's in all the assets that we create for them," Chien concluded. Symantec will be speaking on this campaign at MarketingSherpa Summit 2016, held February 22-24 in Las Vegas. 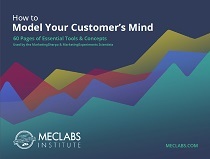 This case study has also been selected as one of five finalists for the MarketingSherpa Award — Reader's Choice Campaign. Keep reading MarketingSherpa newsletters to see case studies from other finalists and then, in a few weeks, we'll ask you to vote for your favorite on the MarketingSherpa blog.